As during the last lecture the issue of the role of waiting time to medical care was touched, and as I have some personal experience with this topic, I decided to describe how the situation of patients looks like in my country in terms of waiting for medical treatment. First, I want to define what I mean by waiting time – it is namely the time which goes by from symptom appearance to beginning of the treatment. So what I did was asking my family members about their experience in this field – the conclusion was: It is bad. Then I wanted to check what Google would ‘say’ about that. I put the phrase “Health care, waiting time, Poland” and the first article I saw was “Polish health care system is one of the worst in Europe” – so the second conclusion is: it is really bad. How does the Polish Ministry of Health want to deal with this problem? The latest idea was to introduce additional insurance, which would enable wealthy citizens to avoid the lines (but it would not mean that they would be treated in different places than “normal” citizens). But then the poorer part of society would have to wait even longer for medical treatment, which seems to be unfair. Apart from that, the majority of wealthier patients in Poland use the private health care, therefore this solution seems to be pointless because neither would it improve the situation of richer nor poorer people. Personally, I would rather improve the communication between particular health care units and the staff working there. For example in the hospital in the city which I am from, the waiting lists were prepared by few different people and the lack of communication between them led to the situations, in which one person was on many waiting lists making unnecessary chaos and delaying thereby their own treatment. What is more, the more shrewd people use this fact and try to enroll for a lot of lines, thinking that it will make them wait shorter, however, it does not work. Just one month ago the IT system was introduced there and hopefully it will improve the present communication and organization. In 2010 there were 2.2 physicians and 5.3 nurses per 1000 Polish population, while the OECD overage amounted as follows: 3.1 and 8.7. The situation is similar in terms of medical equipment: for example the number of MRI scanners stood for 4.7 per million Polish citizens, well below the OECD overage of 12.5 scanners. However, in my opinion the biggest problem of polish health care is not the distinct lack of staff and medical equipment but rather the poor organization. As a social response to problems and absurd caused by Polish Health Care there was established the Watch Health Care Foundation, which is in my opinion a very interesting initiative that collects and presents reliable data regarding health care services and health procedures to which access is aggravated. Not only the patients, but also service providers, decision-makers and regulatory authorities receive free of charge access to information presented in the form of rankings. Moreover, the website enables users to report cases of limited access to Health Care as well as solutions to those problems. This platform has been not very known yet, but I really hope it will develop in close future. Categories: Access to health care, Health Economics | Permalink. A Market for Kidneys, why not? A Pareto Efficient allocation can be described as one where “there is no way to make some individual better-off without making someone else worse-off”. Efficiency is a desirable property of any allocation, but unfortunately there are many situations in which the allocation is far from efficient. One of them is the donation of kidneys. Although it is well documented that people can live healthy lives with only one kidney, thousands and thousands of people around the world die every year waiting for a kidney transplant. This is clearly a situation where it is possible to make the ones that need a kidney better-off without making the donators worse-off and, thus, an inefficient situation. With this in mind, several economists have been arguing for the abolition of the laws that prohibit the sell of human organs, in order to create a legal market for kidneys. Their main argument is that these laws constraint the supply of organs and therefore do not allow markets to clear. Given that markets usually led to efficient outcomes, why a market for kidneys has not yet been created? In practice the question is not so straightforward and the critics of this propose have two major arguments: (i) wealthy people who need a kidney would bip up the prices and so poor people would be ‘priced-out’ of the market and (ii) only poor individuals would sell kidneys and such sales would be coercive in nature, which is morally outrageous. Regarding the former argument, Adams, Barnett, and Kaserman (1999) suggested that “market-clearing price per organ would be quite low substantially less than $1,000 per organ”. Moreover, several authors sustain that a combination of a free market for kidneys with governments acting as a third-party payer-of-last-resort can eliminate the need to ration kidneys and, thus, everyone who need a kidney (poor or rich) could get one. With respect to the latter argument, the main defense is that people have the right to choose what they think it is better for their well-being, instead of being treated like they were incapable to do so, just because they are poor. However, rather than just discussing in theoretical grounds it is worthwhile to provide some evidence about the only country that legally allows kidney vending: Iran. Since 1988, selling kidneys is allowed in Iran and, nowadays, vendors receive from the Iranian Government a fixed compensation of $1.200 plus a compensation from the recipient between $2.300 and $4.500. The results achieved in Iran are remarkable: since 1999, Iran has had no waiting list for kidneys transplant. According to Hippen (2008), “a sucess [that] no other country can claim”. Competitive markets are not a panacea for all the inefficient situations in the world but, in some cases, and specially in kidney’s one, they can help to achieve more efficient situations, which in this case would mean saving thousands of lives every year. See: Barnett, Saliba and Walker (2001) and Barnett, Blair and Kaserman (1996). For more about Iranian System, see Hippen (2008). Adams, Frank A.; Barnett, Andy H. & Kaserman, David L. (1999). “Markets for Organs: The Question of Supply”. Comtemporary Economic Policy 17(2), 147-155. Barnett II, William; Saliba, Michael & Deborah Walker (2001). “A Free Market in Kidneys: Efficient and Equitable”. Independent Review 5(2), 373-385. Barnett II, William; Saliba, Michael & Deborah Walker (2003). “We Favor a Freer Market in Kidneys”. Independent Review 7(4), 595-598. Barnett, Andy H.; Kaserman, David L. & Blair, Roger D. (1996). “A Market for Organs”. Society 33(6), 8-17. Hippen, Benjamin E. (2008). “Organ Sales and Moral Travails: Lessons from the Living Kidney Vendor Program in Iran”. Policy Analysis, No. 614. Kathryn Shelton, Richard B. McKenzie, “How Free-Market Kidney Sales Can Save Lives—And Lower the Total Cost of Kidney Transplants.” March 5, 2012. Library of Economics and Liberty. 30 September 2012.<http://www.econlib.org/library/Columns/y2012/SheltonMcKenziekidney.html>. Residents of rural and small town Newfoundland and Labrador are clearly not equivalent to their urban counterparts with respect to economic prosperity, educational attainment, housing, and access to health care (…) decision makers should recognize the range of conditions across the province when drafting policy and implementing programs. Residents in rural Newfoundland are four times more likely not to have a doctor compared to urban counterparts. For rural habitants, access time to medical services is higher as they face longer traveling time for appointments and other health services. This leads to varying demands for health care between rural and urban residents, since rural residents may decide not to seek care after factoring in explicit and implicit costs associated with travel. Without increases in efficiency or technological gain, in order to decrease the access time for rural areas the supply of health care must increase. Increasing the supply comes from increasing the number of health professionals directly in the region or by allocating more resources (hospitals, clinics, etc.) to the area, also increasing the supply of professionals. The provincial government offers incentives for workers to relocate to rural and remote areas. Grants, increased incomes, and other benefits are offered to physicians, nurses, and other health professionals in exchange for their commitment to work in rural areas. Even with incentives, common barriers to nursing in rural areas include the lack of services and resources, diminishing population and isolation, shortage of professionals and increased workload, and decreased opportunity for professional development. Budgeting and other constraints impact the ability to provide comprehensive health services across the province. Taking into account the higher cost for workers in rural areas, the distribution of health professionals across the province must be balanced in such a way as to reach the maximum number of patients while ensuring reasonable access time. As the population of rural Newfoundland decreases, health infrastructure such as hospitals and clinics are consolidated in more urban regions. Although resources are in place to offer all residents essential services, major procedures or treatments can only be done at specific locations with the right equipment, located in urban regions. Access time to health care adds additional dynamics to deriving the demand for health services and efficiently allocating health resources. Through policy measures such as incentives to increase the supply of health professionals and the allocation of health resources across the province, the government is able to impact access time for rural residents. With high rural populations, public expenditures on health must be balanced to ensure all residences are covered. The challenge comes with balancing the distribution of health professionals between urban and rural areas while meeting budgeting constraints and reaching the most patients possible. Categories: Access to health care, Health Economics | Tags: economics, health economics, rural | Permalink. Developed countries are experiencing great gains in life expectancy along the past years owing this to improvements in living conditions, public health interventions and evolution in medical care. In this brief comment I will focus on the particular case of Germany. It is common in EU countries to have jointly financed health care systems. In fact, the Social Health Insurance was first established by the German politician Otto von Bismarck. In graph 1 we can observe an increase of the total expenditure on health per capita since the 70s and although this raise is more significant in Germany, it is also common to the EU12 and EU15 countries. 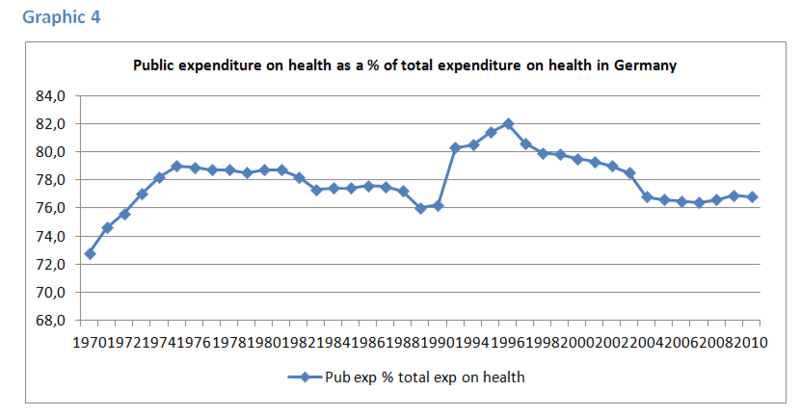 In graph 2 during the period 1989-1990 (there was no data available about 1991) we can perceive a fall in the total expenditure on health (as a % of GDP) that may be due to historical reasons (the reunification of Germany may have led to allocation of funds from health to the catch-up process from Eastern to Western Germany). Still nowadays, the costs of reunification consume four percent of Germany’s gross domestic product annually. 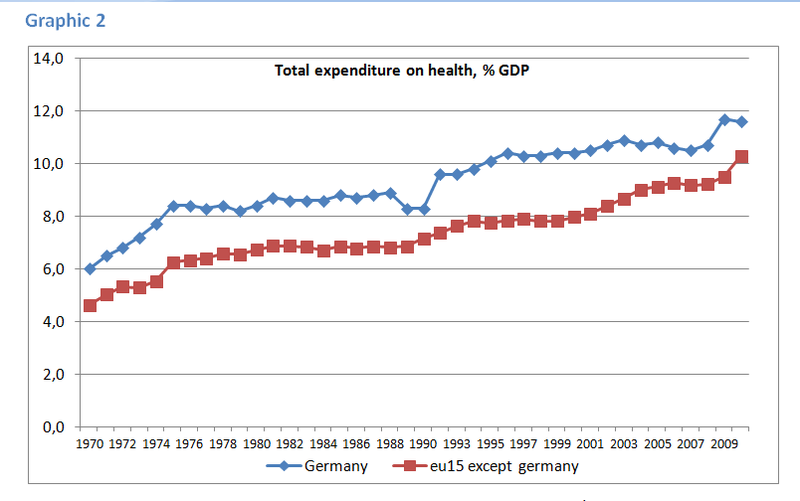 Despite the Euro crisis, health spending has, in fact, been increasing approximately 2% from 2000 to 2010. The only exception happened between 2003 and 2004, where this indicator reached a negative value. Germany’s health system is financed through a Publicly-Financed Scheme (SHI) (statutory health-insurance) but also by Private health insurance (PHI). The public sector is the main source of health funding in Germany. In the graphic 4 and 5 it is noticeable a sharp increase in the public expenditure on health as a percentage of total expenditure after 1992. Nevertheless, after 1996 the weight of the public expenditure on the total expenditure (on health) has been close to 76%, which represents a decline in comparison to the previous 4 years. The introduction of the social long-term insurance provoked an increase in health expenditure leading to the high growth rates between 1994 and 1996. The modest increases in health-care spending in 1997 and 1998, are due to the beneﬁt cuts passed in 1996 and 1997. Since the 1990s, German health care policy has been varying. From a political perspective, the SPD and Greens favoured the citizen’s insurance, while the CDU/CSU preferred a flat-rate insurance. This citizen’s insurance would subject all individuals to health insurance contributions. In Germany, a coalition of the Social Democratic Party and The Greens governed the country from 1998 to 2005. The health sector has been increasing its weight relatively to the overall economy (as a percentage of GDP), almost doubling its share from the 70s to 2010. The ageing trend in Germany, also observed in Europe, and the following need for an increased expenditure in long-term care costs; the lower fertility rate are aspects to take into account when interpreting this variable. Categories: Access to health care, Health Economics, Health expenditures | Permalink.